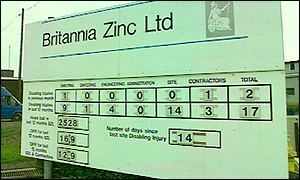 A zinc smelting plant is to close with the loss of 400 jobs, after a planned sell-off fell through. The Britannia Zinc works at Avonmouth, near Bristol, is to begin closing on Thursday. The Australian company which owns the plant, MIM Holdings, first suggested it could close the plant last December because it was losing £2m a month. And last week talks aimed at selling Britannia Zinc to US metal trading company Marco International ended without agreement. The closure announcement was made to the Australian Stock Exchange on Tuesday morning. The Britannia Zinc works is the only one of its kind in the UK and has been at the site, near the Severn Estuary, for 50 years. The plant produced on average 90,000 tons of zinc and 35,000 tons of lead a year. MIM said a 90-day consultation period between trade unions and representatives from the workforce had failed to find an alternative to shutting the plant. MIM managing director Vince Gauci said: "The closure will complete MIM's exit from its two European zinc smelters, the plant at Duisburg in Germany having been sold in December." The company outlined its plan to shut the plant in December. On Monday a vote was taken in which 80% of the workforce requested the consultation period be halted immediately because no viable alternative had been found. MIM had been trying to offload both European zinc smelters for more than a year. The Avonmouth plant would close on Thursday and cease production on or about March 1, the company said.